The annual Stirling Prize for Architecture was awarded recently following much speculation in the media as to which of six recently built buildings would win. The prize is well known, but few know about James Stirling and on what his fame amongst architects rests. 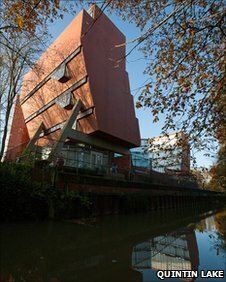 People in Oxford have good reason to want to know because one of the buildings for which he is renowned is here in Oxford: the red tiled building sitting on giant concrete splayed legs looking not unlike a stranded space module next to St Clements car park. This is a student residence built for Queens' College in answer to a wish by the Provost, Lord Florey and a few supporters who "want the best building by the best architect to attract the best students and also research funding", one that he said he did not want to be "boxy and dull but admired by architects." 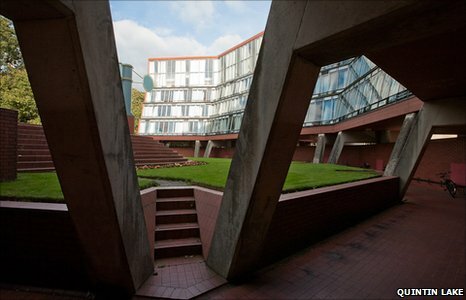 To meet Florey's mission the college engaged the then young and adventurous architect James Stirling, who had built little other than flats in London and two university buildings - the Engineering Department in Leicester (with his then partner James Gowan) and the History Faculty in Cambridge. These three university buildings designed in the decade 1958-1968 all used the same traditional red industrial bricks and tiles and cheap factory glazing systems. With their sculptural and unusual forms they burst onto the 1950's building scene in which so much was minimal and banal as a result of post-war austerity. They were seen as exciting and dynamic and immediately hailed by the profession, and Stirling became a star among architects. But clients and users disliked them from the start: these were strange buildings, the likes of which had not been seen before. It is notable that in industrial Leicester there was no outcry, but in traditional Cambridge and Oxford, where stone building was considered the proper way to build, people rejected them even before they were occupied, with angry letters of complaint in the press. They attracted scorn in exactly the same way as had the radical paintings, music and literature of the modernist early 20th century which, just like Stirling's architecture, threw over traditional styles to which people were accustomed. But whereas with the fine arts if you don't like them, you can leave them alone - leave the gallery, turn the page, or turn off the music, the public is obliged to live with buildings. People have generally got to grips with contemporary styles, but the reception of these experimental buildings became particularly extreme when their untried materials began to perform poorly from a technical point of view. They leaked and suffered the extremes of temperature which were experienced in many 1960's buildings, at a time when the environmental performance of glass was barely understood. Members of Queens' College generally considered the experience a disaster, compounded by their difficult relationship with the architect. Lord Florey was a moderniser from Australia who, minutes of meetings reveal, pushed the College to appoint an architect that others found arrogant and difficult to deal with. Florey supported Stirling and championed the design - but Florey died unexpectedly in 1968 just as building was getting under way, leaving Stirling's opponents to manage the project. All of this produced a toxic mix - the unusual appearance, the poor technical performance and a dislike for the architect set people against the building and against Stirling to such an extent that senior academics in Oxford and Cambridge wrote to all their influential colleagues advising them not to engage Stirling as their architect. As a consequence Stirling built little in the UK for almost 18 years - yet he won commissions in Germany, became a professor of Architecture at Yale and won prizes in Japan. Lord Florey took a risk in appointing such an adventurous architect, and there is ample evidence that some of the problems were caused by the budget being continually cut when all involved in the design suggested more funds were required. For example, Stirling recommended the building be double glazed but Florey himself rejected the suggestion because the additional expenditure would be more than the cost of electricity. It is important to recall that this was at a time when it was thought nuclear energy would bring free electricity to all. When considering the technical failures of buildings of this period it is never acknowledged that architecture is no different from any technological artefact - innovation carries risk. Every constructed device whether toaster, aeroplane or motor car is subject to extensive prototyping before it is used - people accept that progress in technology only comes from some failure and continual refinement, all of which they are prepared to pay for. Stirling took forward many of the ideas developed by the Bauhaus: developing bold and sculptural forms which make clear each part of the building's function, locating each element as bests suits the use of the building - every element in its rightful place. For example at the Florey Building all the service rooms, and the lift and stair towers are at the rear, so that everyone has a magnificent view of the river and landscape. No one, as often happens in many designs, gets an inferior room facing the back. The building also achieves what Oxford colleges have always done - albeit in bold new forms and materials: it wraps itself around an outside space to create a quiet and private courtyard and turns its back on the noisy world. We know from the votes by students that they find it one of the most sociable of the college's residences and despite the technical problems they like to live in it, and find it exciting. That is what architecture should be about. But there is no getting away from the building's unattractive aspect when you approach it through the car park and service yard. The front entrance was designed to be, and remains, on the other side, facing a public riverside route that was to run from the end of Magdalen Bridge, (where there are now private steps down) leading to New Marston. But this has never been built, leaving Stirling to be criticised because the back has to be used as the front. How wonderful it would be, not just for this building but for all Oxford's citizen's, if that riverside walk had been realised. 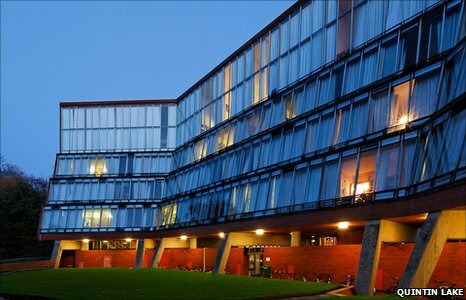 The Florey building, together with the two other buildings in "The Red Trilogy" is now Listed. This acknowledges their extraordinary forward looking forms and qualities and their experimental, ground breaking nature. They are visited by architects from all over the world. Lord Florey didn't live to see his building completed, nor the problems it has experienced. But modern methods of construction can solve these problems and his dream can now be fully realised. Alan Berman is a founder of architects Berman Guedes Stretton, Oxford and London, which has carried out detailed analysis of the Florey Building. He has just published "Jim Stirling and the Red Trilogy - Three Radical Buildings" pub. Frances Lincoln, London.